In 2016, the New York Energy Research and Development Authority (NYSERDA) launched the Clean Energy Communities program to help local NYS municipalities embrace clean energy projects, programs, and policies. UBRI is part of a statewide technical assistance network helping NYSERDA implement this program. Our team is conducting outreach and offering hands-on technical assistance to communities in Erie and Niagara counties. The Clean Energy Communities program is organized around “10 High Impact Actions” designed to help communities save energy costs, create jobs, and contribute to statewide energy and sustainability goals. Actions involve activities like measuring and reducing energy consumption, encouraging solar installations through permitting and localized campaigns, investing in electric vehicles and charging infrastructure, LED street lighting, code enforcement training, and more. Communities that complete at least four High Impact Actions receive a “Clean Energy Communities” designation from NYSERDA and are eligible for grant funding to implement additional sustainability projects. 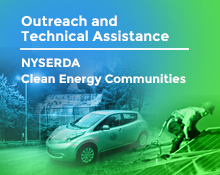 UBRI is offering hands-on technical assistance to help communities navigate the NYSERDA initiative and complete High Impact Actions toward achieving designation. Our Technical Assistance comes in many forms based on the needs of the community and the identified actions they take. Examples of assistance include: identifying and assessing potential clean energy opportunities that fit community needs; developing materials and strategies for community campaigns; compiling, organizing, and analyzing data related to municipal energy use; and tailoring local laws and policies that make clean energy easier for businesses and homeowners. Our Clean Energy Communities technical assistance team can help identify what actions are achievable in the short term, and can help create a framework for long term sustainability planning. Community action to advance clean energy in Buffalo Niagara contributes to implementing the regional vision set out in One Region Forward. The work to assist local municipalities through the Clean Energy Communities program is part of UBRI’s ongoing commitment to support the implementation and tracking of progress for One Region Forward. This work recognizes that moving One Region Forward can occur at various geographic scales and through actions that work for many diverse local communities. To learn how your community can get involved with the Clean Energy Communities program, please contact the UBRI Clean Energy Communities coordinator Jason Kulaszewski at (716) 878-2441. This entry was posted on February 20, 2018 .